And on his way to his furrever home in Arizona! There's a purrfect home for every cat given patience and time. On October 13, Bambi left California to begin the first day of the rest of his life in his furrever home in Arizona!! He wil be honored and loved and given all that he needs from this wonderful couple. Bambi is a special skills kitty. He has Cerebellar Hypoplasia (CH). Now, that’s a big scary word, but it’s nothing to be afraid of. Here’s an excellent website to learn about CH: http://www.chkittyclub.com/ Plus, there are online groups for people to come together to share their experiences. The bottom line is that CH kitties have challenged motor skills and may need some accommodations in their living arrangement — including keeping him indoor-only forever. 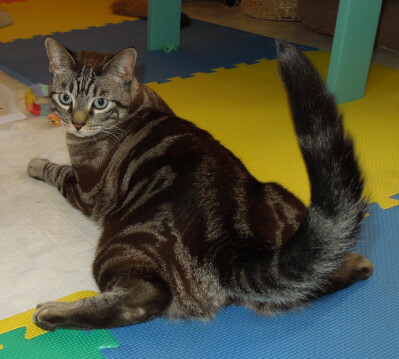 Bambi is about 4 years old – neutered, tested & in excellent health — and he’s a big boy of 15 pounds! It’s heartbreaking that some people don’t know or understand how easy & wonderful it is to live with a CH kitty and end up dumping them at shelters - which is where we retrieved him. What is so very exceptional about CH kitties is their totally affectionate nature. Bambi is at the top of the charts with this attribute. If you’re standing near him, he will come over and lean on your leg. If you’re sitting down, he’ll work his way into your lap so that he can cuddle on your shoulder – purring contentedly. You’ll never want for affection or attention from Bambi. 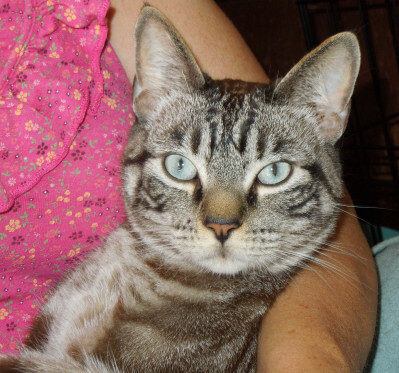 Bambi is an affectionate cat with a sweet-nature who looks for love in any lap he can find. He's perfectly normal about playing and loves toys. He just plays with them a little differently. And, for the first time, he has had to get along with new cats & he's done very well. His CH is moderate so he falls regularly, but he gets where he wants to go and even climbs up a little. While he's good about getting into the litter box, he sometimes will need maintenance after. 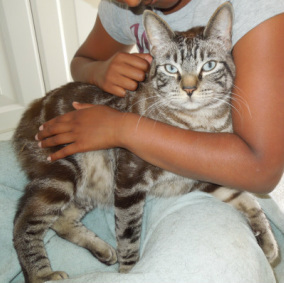 Bambi is as good looking as he is sweet with Tonkinese coloring in a classic tabby pattern. He has no health issues. He would so love his own home - and this time we hope its a REAL forever home. And most important, click here for some videos of life with Bambi. Soon you will find that there’s nothing in the world that you wouldn’t do for your CH kitty. You can click here to submit an application for this fabulous kitty!